Award Winning Family Home - Owner Managed, No Rental Agency With Extra Fees! We have offered our home to guests for 8 years and only receive top reviews. As an owner/manager I also ensure our guests receive the same attention to detail that I have in my own home. Our home was built in 1886 and is a 1900 Storm Survivor. We are centrally located in the heart of the Lost Bayou Historic District. Seawall Blvd with the beach, restaurants, activities and the Pleasure Pier are just 8 blocks away and a 2 minute drive. We are also just 8 blocks to the Historic Strand District. Families with children are welcome for relaxation and to make special vacation memories. Although the house has been updated with modern amenities, all guests have commented on the tranquil atmosphere that exists when they walk thru the door. We have off street parking for 2 vehicles. Parking is also available on the street. 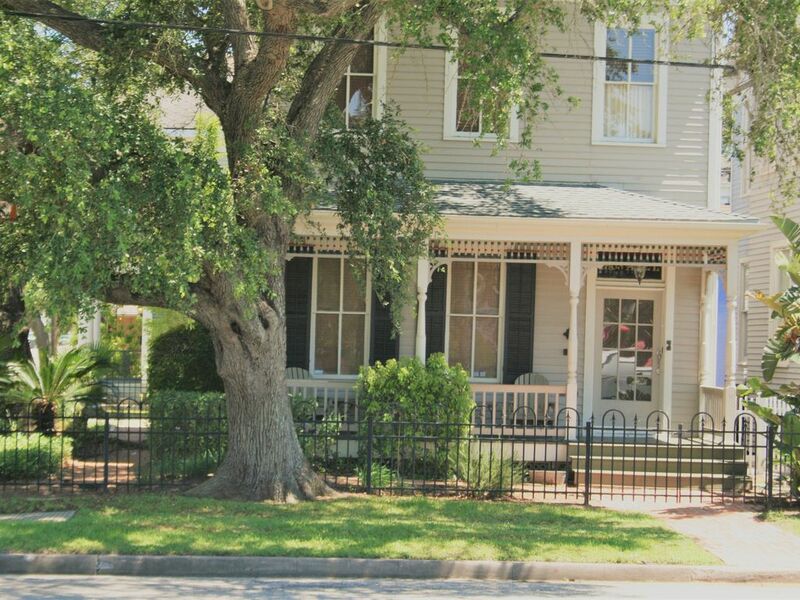 Three bedrooms with queen beds and a full bath are located upstairs. A sofa sleeper with an extra comfortable mattress topper is located downstairs in the study. A bath with shower is also available downstairs. The kitchen is fully stocked with cooking implements and dishes. Just bring your clothes and enjoy everything our home and Galveston has to offer. We are a Galveston Historical Foundation 2009 Post Ike Recovery Restoration Award winner and are one of three homes featured in the November 2010 issue of the Galveston Monthly Magazine. Dawn was an awesome host, and had great recommendations for any foodies out there. Thank you and so very glad you enjoyed our home and restaurant recommendations! Hope you will stay with us again. Take care. Like stepping into a bit of history...a 1900 survivor that has been lovingly restored and updated. The home is well furnished, clean and spacious. Dawn, the host was very helpful and responsive. She was available if we needed her (which we didn't), and left us alone to enjoy her home. Everything worked fine. You can tell the house is well maintained. There are some tasteful period antiques that add to the charm. We enjoyed the neighborhood and the proximity to the beach and the Strand. We could walk our dog to both areas. The park across the street was fun for our dog and grandchildren! Loved having you as our guests! So enjoy sharing our home. Hope you will stay with us again when in Galveston. We really enjoyed our stay. It is a beautiful home with great antique furniture. The park across the street was great for the grandkids and the dogs. We couldn't have had a more wonderful stay for Christmas! Thank you! We love our guests and try very hard to ensure their comfort. Hope you will choose us again when you are in Galveston. We had a wonderful time staying in this beautiful home! The house is beautiful, very clean and well kept. And the location was awesome!!! Thank you and very glad you enjoyed your stay with us. We love sharing our home and try to ensure our guests have all the comforts! We had a great stay here. The house was clean and comfortable and well suited for a large family. Will definitely return. Thank you so very much! We try to ensure our guests have all the comforts of home and will enjoy you spending more time with us when you are in Galveston. Beautiful, well-kept home. Everything we needed (well, except food, durn it) provided. See above. One warning: 19 steps from first to second floor. Truly enjoyed our stay. Thank you and so very glad you enjoyed your stay with us. Yes, historic homes have very tall ceilings and lots of steps to the second floor! Hope you choose to stay with us when you are in Galveston again.